I’m excited to have my friend Carlie Kercheval on my blog today. Carlie and I haven’t meant in person (yet!) but I love her heart. Carlie loves to encourage and inspire women. I know you’ll be inspired! Personally, I’ve benefited from Scripture memory, too. I love how God springs those Scriptures back to me right when I need them! He’s so good! Scripture memorization is a vital part of my relationship with Jesus. From the moment I accepted Christ into my heart in the fall of 1998, God was clear that I needed to begin to the intentional practice of hiding His Word in my heart. At the time I was a junior at Washington State University and unsure how I could add memorizing Scripture into my full schedule of law classes and working full-time. I prayed and asked God to show me practical ways to hide His Word in my heart, and he clearly answered with 4 strategies. And the best part? These 4 strategies are things that I was already doing every day and my guess is that many of you are, too. I know, I know. This goes without saying, right? Let me share something with you that may help if you are in a season busy that doesn’t allow for a lot of time in God’s Word: Reading one Scripture at a time is enough. Yep, I said it. And it’s true. We don’t have to be fooled into thinking that we need to be in the Word for hours each day to be a “good Christian.” As a matter of fact, very few of us will retain what we read because we are so busy being parents, working, etc. However, if we will dedicate ourselves to reading at least one Scripture a day, we will find that even in our season of “busy” we’ll be able to retain what we read. As many of you already know, we all learn differently. However, even though we may have one particular way we learn best, our brain processes the information it receives in different areas of the brain. When we take something we are learning and tackle it from various avenues, our brain begins to connect the information, thus making it that much more concrete in our minds. Writing has been proven to help us retain information due to the fact that you are listening and recalling information as it is occurring. According to a study done by psychologists, Mueller and Oppenheimer, note taking not only increases memorization but also help us conceptualize what we are learning. While we hear this word a lot, I find that many people are unsure of what it actually means. What exactly is meditation? According to Merriam-Webster’s online dictionary, meditate is defined: to spend time in quiet thought for religious purposes or relaxation. When I am meditating on a particular verse of Scripture I always find myself thinking about it over and over. It helps me to stay focused and gives me a great sense of God’s peace. Not only does meditation it help me to memorize God’s Word – it uplifts my spirit and encourages me to put my faith into action. Every time we talk about God’s Word, we are hearing it and building our own faith. This act of faith-building is a wonderful addition to memorizing Scripture. And let’s be honest, as people of God, nothing is more exciting than talking about than Jesus! As I began to implement these 4 strategies into my daily routine as a busy college student, I began to see a tremendous change in my heart and every-day attitude. I began to notice that even when I was rushing and didn’t have time to read my Bible before class, His word was always at the forefront of my mind. I was amazed as my tongue was being tamed and my thought-life was drastically changing (for the good). It was nothing short of amazing. Here I am, nearly 20-years later, still using these 4 strategies to help me continually memorize God’s Word. And it works! I love this method so much that I wrote a book about it. In my book, Matters of the Heart: a 52-Week Scripture Memorization Journey for Women, I encourage women for an entire year to memorize Scripture through reading, writing, meditating, and talking to others about their faith. During launch week, August 1-8, you can grab a digital copy of my book Matters of the Heart, the companion prayer and reflection journal, and the 52 printable scripture pack for just $15! Do you want to increase your faith and memorize God’s Word? Then head over and grab your copy today! Carlie Kercheval is a happily married work-at-home homeschooling mom. She and her college sweetheart have been blessed with 3 precious children to raise while traveling the world as a military family. Carlie is the founder of Today’s Frugal Mom™ and Fulfilling Your Vows™. She is also the co-author of the Learning to Speak Life Books™ family Bible studies. When she is not busy enjoying her family and the great outdoors, you can typically find her cozied up somewhere under a blanket with a good book. You can connect with her on Facebook, Pinterest, and Instagram. 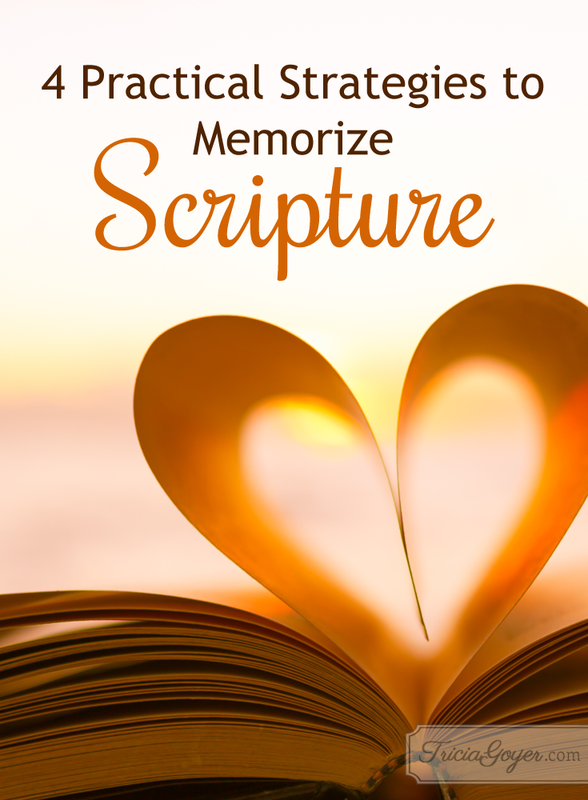 Thank you for encouraging Scripture memorization and for these great tips! Personally, I recommend the app Bible Memory: Remember Me. Quizzes, flashcards, audio recording, playback and an intelligent review system help you to memorize your favourite verses from 44 Bible versions. It’s so easy to use it is even part of Google Play for Families.